Government Profiting From Student Loan Defaults? It’s a jaw-dropStudent Debtping claim, but one that Alan Collinge, founder of StudentLoanJustice.org, a consumer advocacy group, is confident is true. The Wall Street Journal ran an interesting piece last week suggesting the federal government collects a hefty portion of defaulted student loans. But Collinge – who was quoted in the story – argues that it didn’t quite paint the real picture. “After paying the companies that actually collect the loans and other costs, the U.S. Department of Education expects to recover 85% of defaulted federal loan dollars based on current value,” says the WSJ, noting that the percentage of student loan collections are relatively huge compared to collections on other defaulted consumer credit. Banks, for example, might retrieve 10 cents for every dollar from past due credit cards. And therein lies some possible profit and perhaps a serious, twisted incentive to offer students six-figure loans they will most likely never be able to repay. ”Given a current defaulted loan portfolio of approximately $60 billion, the amount of revenue this represents to the Department of education is in the tens of billions of dollars,” writes Collinge in his self-published report. This is a World Socialist Web Site investigative report on the history and predatory policies of the student loan industry. This specialized wing of the finance industry is bankrupting a generation, unabashedly profiteering from the determination of young people to learn, be productive and secure a college degree. Today’s young adults face a lifetime of diminished expectations, if not outright poverty. A majority of those attending college find themselves caught in the vise of a scissors crisis?low wage jobs and astonishing levels of student loan debt. This financial strain is leading to rising incidences of depression, broken marriages, the postponement or abandonment of child-bearing, and even decisions to permanently leave the country. The majority of the parents of college students, after decades of stagnating wages, had only one asset, home equity?a resource that has either vanished or become a punishing debt load under the impact of the housing meltdown. Now the younger generation has mortgaged its future in the form of student loan debt. The two pillars of the much-touted “American Dream”?home ownership and a college education?have become the means by which the financial aristocracy is plundering both the present and future resources of the working class. Student debt is not just consumer debt. It is the most onerous kind of consumer debt because student borrowers do not receive standard consumer protections. Their loans are undischargable in bankruptcy, usurious penalties are legal, and there is no statute of limitations. The Obama administration “reform” measure for student loans, which took effect July 1, will do nothing to address the banks’ stranglehold over the younger generation. Its key provision is the elimination of the government subsidy to private companies for loan originations. This will have the effect of saving a projected $68 billion?not for students, but for the federal government?by favoring direct loans over the Federal Family Education Loan (FFEL) program. The role of private lenders in servicing, i.e. profiting from the loans, is unchanged. Alan Michael Collinge was one victim of this industry. By training he was an aerospace engineer, but was laid off and unemployed for two years, consequently defaulting on his student loans. He decided to not just tell his story, but to detail the rise of this billion-dollar industry in his 2009 book The Student Loan Scam  and the web site Student Loan Justice. An example of the personal experiences documented in Collinge’s book is summarized below. What is profoundly disturbing is not only this specific outcome, but how frightfully commonplace such stories are. Robert borrowed $42,000 in undergraduate and graduate school loans in the 1980s, all guaranteed by the federal government. His loans included funds for law school, but due to low grades he was unable to graduate. He ended up defaulting on the debt and the loans were referred to Sallie Mae for collection. In the 1990s, Robert rehabilitated his loans and has since maintained all the monthly payments. In 2009, he owed $45,000 and could still afford to pay only the interest at 9.5 percent?$450 a month. Recent figures are showing student default rates?over the life of loans?ranging from the staggering rate of 25 percent to 33 percent and even higher. From 1994 to 2008, average debt levels for graduating seniors more than doubled to $23,200, according to The Student Loan Project, a nonprofit research and policy organization, with more than 10 percent of those completing their bachelor’s degree burdened with over $40,000 in debt. The most recent complete statistics cover 2008. As of that year, 62 percent of students from public universities had debt, 72 percent from private nonprofit schools, and 96 percent from private for-profit schools. As all these figures predate the economic crash, the percentages are undoubtedly substantially higher today. Student loans have become the most lucrative form of debt in the finance industry, Collinge points out, because lenders have the most invasive collection rights and the federally mandated right to impose usurious fees and penalties. The industry is legally able to garnishee wages, tax returns and Social Security and disability payments without so much as a court order. The other side of the ever-rising cost of college is explained in a recently released US government report, “The Rising Price of Inequality”. This comprehensive study documents the ways millions of qualified young people are being excluded or driven out of college because of its escalating price tag. Using a statistically rigorous method, the study shows that among low- and moderate-income students, at least 3 million academically qualified young people have foregone their bachelor’s degree due to finances. These figures are based on trends prior to the worst of the current crisis. The government report notes that “our financial aid system is founded on the principle that any youth, regardless of family income, should have the financial opportunity” to pursue a bachelor’s degree. It then provides the statistical analysis to show that this “longstanding principle” has lost any significant meaning. What are the origins of the democratic idea that everyone should have the right to pursue a higher education? In an opening section, The Student Loan Scam points to two key developments in the expansion of public education. The author writes: “Prior to the war [World War II], college educations were largely the province of the well-to-do, completely out of reach for low- and middle-income Americans, the vast majority of whom did not even finish high school. When President Roosevelt signed the GI Bill in 1944 this began to change.” Author Collinge mentions that Roosevelt was cognizant of the social explosion that demobilized and hungry army veterans posed. This point is critical. Just 12 years prior to the enactment of the GI bill, in 1932, tens of thousands of unemployed World War I vets had camped in Washington for months, in what came to be known as the Bonus Army, to demand their promised government bonus. Fearing the growing anger in the country, President Hoover ordered the veterans dispersed, and General Douglas MacArthur opted, in violation of military procedure, to personally command the attack. The army utilized tanks, fixed bayonets and gas. It dispersed the Bonus Marchers and then burned down their families’ encampment, killing three people and injuring 54. In justifying this unprecedented military attack upon the country’s own veterans, MacArthur cited the risk of communism, invoking both the Hunger March in Detroit of that year and the mass funeral demonstration that followed, when 30,000 workers gathered and sang “The Internationale” to commemorate four martyred protestors. Roosevelt’s GI bill arose out of a fear that these struggles would renew. The bill provided loan guarantees for housing, assistance for unemployed veterans, and college tuition and a stipend for living expenses for students. Of the three elements, free access to higher education was by far the most widely used, explains Collinge. By 1947, nearly 50 percent of all new college students were returning military personnel. The bill would eventually help educate 7.6 million Americans. This dramatic expansion of college education, like all social reforms under capitalism, was a byproduct of the struggles of the working class. In the early 1950s, the US population was still, for the most part, poorly educated, with only one person in four gaining a high school diploma. This statistic gives a sense of the scale of the next expansion of college accessibility, with the implementation of President Lyndon Johnson’s Great Society programs. This series of social reforms was enacted in an attempt to stem a semi-insurrectionary domestic crisis which encompassed both the civil rights movement of the 1950s and 1960s as well as extremely militant labor struggles, including the national steel strike of 1959 in which a half million steelworkers were ordered back to work under Taft-Hartley, the months-long 1968 New York City teachers’ struggle, the five-year long strike of the Delano grape workers, a series of Chrysler wildcat actions and many other similar events from coast to coast. Johnson and the American bourgeoisie responded with legislation designed to substantially increase opportunities for minorities and the working class as a whole?and bring a section into the American middle class as a stabilizing force. In 1965, the Higher Education Act created a system of government-funded grants and scholarship programs to help less well-off youth go to college. Additionally, it provided federal loan guarantees to banks to promote lending to students. In the early 1970s, one could attend a public university at a modest out-of-pocket cost, largely paid by grants, work-study and summer jobs. Most students could graduate with no debt. Where then did the student loan industry come from? This can be answered simply. Since the 1970s, the burden of college costs has shifted dramatically from the government to the student. Today, the cumulative principal and interest that is owed is calculated at $850 billion! (This figure includes the newer and more expensive private loan products, not yet invented in the earlier years). The collapse of the labor movement in the 1980s facilitated the rollback of educational gains alongside the shredding of so many other post-war advances such as pensions, health care and federal regulation of industry and agriculture. The Higher Education Act was amended six times, becoming progressively more lucrative for lenders and more onerous for students. The Student Loan Marketing Association (Sallie Mae), founded in 1972 as a GSE (government sponsored enterprise) and supervised by the US Treasury, was spun off in 1995 to transition to a for-profit operation. 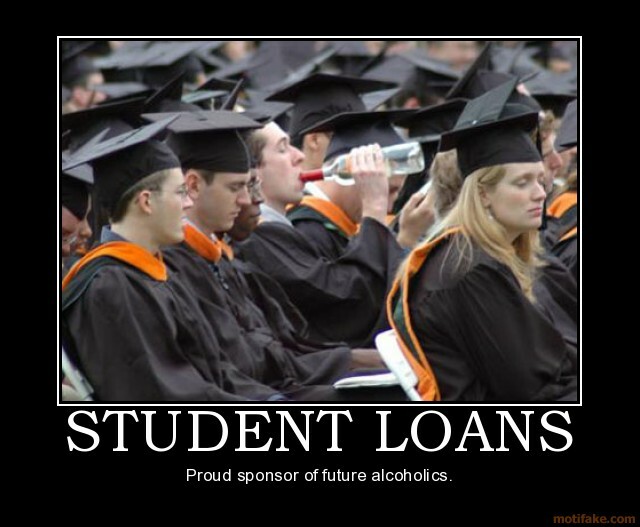 In 1995, the Student Loan Marketing Association (Sallie Mae) began the transition to a profit-based operation. This process is documented by The Student Loan Scam. Between 1997 and 2006, Sallie Mae’s holdings grew from $45 billion to $123 billion, as the cost of college skyrocketed. In a five-year period, its stock increased by nearly 1,700 percent. The company set aside, according to the Securities and Exchange Commission, $3.6 billion for stock bonuses in 2005. Under threat from the nonprofit Direct Loan Program signed into law during the Clinton administration, SLM began marketing its loan products directly to students. Because it was so well known and easily mistaken as a non-profit, Sallie Mae was in an unusually well-placed position to expand its operations. It signed up colleges to “school-as-lender” programs and secured places on schools’ “preferred vendor” lists. Universities made money on their students’ loans if they went through Sallie Mae, and the lender began courting financial aid officers with trips, parties and various other additional inducements. College kickbacks were small potatoes, however, compared to the millions of dollars Sallie Mae spent lobbying Congress in the 1990s. Collinge demonstrates that its efforts paid off. In 1998, Congress approved legislation that allowed for massive penalties and fees for delinquent student loans, legislation that actually made it more profitable for the lenders and guarantors when students defaulted than when they paid. The 1998 amendment to the Higher Education Act provided for collection rates of up to 25 percent to be applied to the debt. What is a guarantor? It is a type of fiduciary organization created by the Higher Education Act of 1965 to share risk, alongside the federal government, as a “guarantor” of student loans. However, in practice, Collinge says, they don’t. They receive government funding for undefined “oversight” but confine their work to attaching massive penalties and fees to defaulted loans and then passing them along to collection agencies they might, or might not, own. Around 2000, Sallie Mae purchased two of the nation’s largest student loan guarantors, USA Group and Southwest Student Services. These guarantors have created another level of million-dollar executives overseeing operations with a captive clientele. Sallie Mae also went on to purchase the student loan collection companies, so that by 2006 it dominated all aspects of the student loan industry. Sallie Mae has been sued for its unique position as both a lender and a collector. According to CBS News, in 2005 nearly a fifth of its revenue came from collection agencies. Collinge points out that its fee income increased by 228 percent between 2000 and 2005, from $280 million to $920 million, while its stock price increased 1,600 percent in the decade of 1995 to 2005.
chartIn 2005, Sallie Mae was named by Fortune as the second most profitable company in the US (Microsoft was 18th that year), with its CEO Albert Lord the highest-paid CEO in Washington, D.C., that year. In 2007, the New York Times estimated Lord’s holdings in the company at $450 million. In 2008, he received $4.7 billion in compensation, according to the Washington Post. While the market crash of 2008 meant decreased earnings for the loan giant, as of 2010’s second quarter, SLM is back with a “respectable” earning rate of $0.39 a share or $209 million including interest income of $759 million, a good investment for Wall Street at the expense of increasingly indebted students. How does this incestuous relationship between Sallie Mae, guarantors, and the federal government work? For example, you borrow what is in fact a modest $20,000 to attend a public university, say the University of Michigan for four years, and pay out of pocket an additional $80,000 minimum during that time for room and board. You elect a 12-year loan repayment plan. The federal government will guarantee this. If you pay this off at 8.8 percent interest over 12 years, you will pay $23,376 in finance charges. If you cannot pay the $293 a month, after 270 days you will default. The federal government will pay Sallie Mae the balance of the loan, plus interest. It will then send the debt to a collections agency. The agency w ill add 25 percent to the loan as a collection fee. Additionally, it will receive a 28 percent commission on the loan (which you will pay). The largest collection agencies in the country are owned by Sallie Mae; therefore, they get the “second bite of the apple.” The agency can garnish your wages, tax refunds, etc. There is no statute of limitations, meaning that even if it waits until you claim Social Security, you will pay. In 2005, the Bankruptcy Abuse Prevention and Consumer Protection Act (engineered by the credit card companies and banks) made all student loans, even those not guaranteed by the federal government, nondischargeable in bankruptcy. Student loans were also specifically exempted from state usury laws and exempted from coverage under the Truth in Lending Act. More than 5 million defaulted student loans are on record with the US Department of Education as of 2009; Collinge estimates there are at least another 1 million private loans in default in addition. Collinge’s volume goes on to detail the illegal relationships between Sallie Mae, Congress, and the Department of Education (which supposedly was in charge of oversight) and the financial aid departments of colleges. Bribery, kickbacks and conflicts of interest are everywhere. • Lenders were paying kickbacks to universities based on a percentage of loan volume that the schools’ financial aid offices steered to lenders. • Lenders provided all-expenses-paid trips to financial aid administrators and their families to exotic destinations. • Lenders ran call centers on behalf of universities, often answering phones claiming to be representatives of financial aid offices when they were really employees of lenders. • Lenders offered large sums of money to universities to drop out of the government Direct Loan Program. As a result of this one investigation, the University of Pennsylvania, New York University, Syracuse, Fordham, Long Island University and St. Johns agreed to reimburse former students a total of $3.27 million for inflated loans. • Families are spending higher and higher proportions of their income to assist their children in getting an education. A 2008 study by the National Center for Public Policy and Higher Education, cited in Debt-Free U by Zac Bissonnette,  states that low-income families contribute, on average, 55 percent of their earning towards their children’s public, four-year institutions, up from 39 percent in 2000. • The average cost, net of grants, for attending a four-year public university for a low-income student is $11,700 annually, with an average loan burden of $36,000. For students from moderate-income families, the cost will be $18,450 annually with a loan burden of $63,800, according to “The Rising Price of Inequality. • Instead of four-year colleges, many young people are opting for community college, highly touted as a cost-effective solution. “The Rising Price of Inequality” study shows that there is a big hidden cost: high school graduates from low-income families who enroll in a community college, as compared to a four-year university, are four times less likely to earn a bachelor’s degree. Even before the current economic crisis, the rates of enrollment in four-year colleges for academically qualified low-income students had declined precipitously. In 1992, 21 percent of low-income students enrolled in a two-year college; by 2004, that number had risen to 31 percent. Ellen from Pennsylvania is profiled in The Student Loan Scam. She had only a GED (General Equivalency Diploma), but after her husband died in an auto accident, she applied to college. She was admitted and was able to finance it by working, grants and federally guaranteed loans. She excelled and went on to graduate school, maintaining a high grade point average. But her father had a heart attack and then a stroke. She was needed to care for her elderly mother. “I had borrowed around $60,000 in federally backed Stafford Loans to go to Law School in the mid 90s,” says a reader of collegescholarships.org. “After graduation, I consolidated the loan (it cost maybe $7,000 to do so) and then the loan was sold and re-sold a few times, and finally ended up with Sallie Mae anyway, where it more than tripled over a period of 10-12 years. “I never could make the payments. They were $700 a month after graduation in 1996, and are now close to $2,000. I just never had the extra money after my rent and car payment, etc. I never was very successful in law. I just kept signing up for more forbearances, and economic hardship deferments, etc. But the interest never stopped accruing (I never had the option of preventing that). I never understood how it all worked—nobody did really. “It is only in the last couple of years that people like Allan Collinge and C. Cryn Johanassen have tried to analyze the whole crazy Student Loan ‘Phantom Industry’. “…I ended up using up all of my forbearance and hardship options, and defaulted with Sallie Mae about two years ago. The loan went back to NY State Higher Ed. All was quiet for several months, until I started getting calls from a private collection agency, offering me yet another consolidation ‘opportunity’. This time with Direct Loans.… The collection agency instantly added $10,000 to the balance as a result, and the loan is now in the hands of Direct Loans or the federal government, as I say. “And there the loan will stay for the next 20 to 25 years, collecting interest of course. If I never pay off the balance, the loan will be ‘abated’ or discharged. But I will owe taxes on the discharged amount. “Fair enough. If the balance on the loan is half a million dollars, I will owe the IRS over $150,000 in taxes I think. If I cannot pay that, I go to jail because isn’t that what the IRS does to delinquent taxpayers? Put them in jail? And that is how many other Educated student loan borrowers will end up in jail when they should be getting ready for retirement. “The good news is that I now can now make income-based payments, which provides for a chance to try and better my income, and figure out a way of possibly paying the loan off, because I certainly do not want to end up as a new fish in what amounts to a debtors’ prison someday. And I must say that is a big motivation. “I was married at one time, and my ex would wake up at 3 a.m. many times, very worried about the student loans, and the idea of her tax return being garnished—a lien on the house that was in her name—and other possible collection efforts. Lots of paranoia. But the cause of real worry and stress nonetheless. “We ended up divorcing. The student loans played a part in breaking up the marriage. They were entirely mine, taken out before the marriage. But somehow, it seems, a spouse can now be dragged into the whole financial mess, no matter when the loans were taken out. So maybe the divorce was a blessing for her. It allowed my ex-wife to retain all of her assets, and the roof over her head. An August 7, 2010, article in the Wall Street Journal, “When Student Loans Live on After Death,” detailed the case of a private student loan company that punitively pursued the co-signing parents of a young man who tragically died of a fall while attending Rutgers University. The parents have continued to pay on the loan. The article points out: “Mae, Citibank and Wells Fargo may require co-signers to continue paying private student loans after the primary borrower has died, though the lenders say they will look at cases individually. Wells Fargo doesn’t offer medical forbearance, just a three-month period of hardship forbearance during which the interest compounds. We reject the near-constant refrain, shared by Debt-Free U, that students are responsible for their indebtedness and that they should downgrade their expectations. Columnists such as the New York Times’s David Brooks have suggested that the US has too many educated youth and this unreasonable surfeit of education is now skewing the unemployment figures. This layer is advocating for a return to the conditions when only the elite had the right to be educated. Nor can this huge social issue be in any way addressed by pressuring Congress and the Democratic Party, as advocated by Alan Michael Collinge. The Democratic Party, wholly subservient to the financial oligarchy, is not considering a single measure to challenge the ability of the banks to profit handsomely on the cost of higher education. The Health Care and Education Reconciliation Act, signed by Obama on March 30, 2010, represents a net decrease in government funding for education. By eliminating the subsidies for private loan origination, the government will save an estimated $68 billion. From this pot, Pell Grants for the most impoverished students will rise by a miniscule $200 a year each, far less than average tuition hikes. In what passes as a “reform,” students have been offered the chance to extend their loans longer, based on an annual ceiling of 10 percent of income. Interest rates will decrease (this year) but, due to the extraordinary low Federal Reserve rate, remain highly profitable for the banks. After 25 years of payments, remaining federal student loan debt can now be discharged. Students will remain in indentured servitude until their own children enter college. Even the most aggressive of the tepid measures discussed on Capitol Hill merely calls for allowing students to declare bankruptcy, restricting the so-called subprime loans to overborrowed students or penalizing private colleges that pay recruiters and have huge student default rates. The Socialist Equality Party considers education a basic right. It should not be a source of profit. We call for the forgiveness of all student loan debt and the right to free education for all, from pre-school through college and adult education. There must be a series of socialist policies to dramatically expand education and provide access to mankind’s collective culture to all on a free and equal basis. We urge students to join the International Students for Social Equality, study the program of the Socialist Equality Party and devote themselves to fighting for these policies throughout the working class. 1. www.finaid.org/studentdebtclock provides a ticking clock illustrating the cumulative state of college loan debt in America. Finaid.org is a public service web site. 2. The Student Loan Scam, The Most Oppressive Debt in U.S. History?and How We can Fight Back by Alan Michael Collinge, Beacon Press, Boston: 2009. 3. The Chronicle of Higher Education (July 2010) puts the overall default rate at 20 percent, with a whopping 40 percent rate for students at for-profit institutions. StudentLoanJustice.org puts the overall number at 25-33 percent and cites the 2003 Final Audit Report of the US Department of Education, which explains the approach the federal government takes to its calculation and how the reporting system minimizes official defaults. It notes, for example, that schools which report lower default rates are eligible for requirement waivers and greater subsidies. Additionally, the liberal think-tank NewAmerica Foundation notes that a staggering 65 percent of proprietary schools (privately owned for-profit colleges such as Phoenix University, Corinthian Colleges, Kaplan University, etc.) have default rates over 20 percent. 7. Bissonnette, Zac. Debt-Free U, Portfolio Penguin, New York, NY: 2010. When you consider that 42 million Americans suffer functional illiteracy, i.e., they cannot read, write or perform simple math, and another 50 million cannot read past the 4th grade level-we’ve got a problem. At this time, 7,000 high kids drop out of high school every day. (Sources below) We feed 43 million Americans with food stamps. That’s a lot of dumb people. If we expect to remain a first world country, we need college educated men and women to offset the lack of critical thinking, personal accountability, personal responsibility and intelligent citizenship lacking in over half of our population. A mind numbing half of Americans do not vote in national elections. Over 80 percent do not vote in local elections. Thomas Jefferson and Ben Franklin understood that for a constitutional republic to function, it needed to maintain an educated public. At the rate we’re going, we won’t have enough intelligent people to work jobs to pay taxes for all the empty brains vomiting into our society annually. · The number of adults that are classified as functionally illiterate increases by about 2.25 million each year. · 20 percent of high school seniors can be classified as being functionally illiterate at the time they graduate. · 85 percent of all juvenile offenders rate as functionally or marginally illiterate. · 43 percent of those whose literacy skills are lowest live in poverty. NBC anchor Brian Williams reported that 1.2 million teens hit America’s streets every June unable to read or write. Detroit, Michigan epitomizes this country’s educational dilemma: 76 percent dropout/flunkout rate. Dozens of cities across the country suffer 50 to 60 percent dropout rates. Another 43 million Americans subsist on food stamps! I cannot emotionally or intellectually get my arms around 43 million Americans sucking off the public taxpayer rolls. We’re talking about 42 million illiterates and 50 million nearly illiterates that almost cover one-third of the American population of 312 million. This nation must take a hard and long look at its tendencies to create wars half way around the planet that cost taxpayers $12 billion monthly while our college costs soar beyond the average student’s abilities to pay. We must ask ourselves if we want a viable, first class civilization or an illiterate polyglot. We must come to terms with our waste, war and lack of concern for the future. In short, we desperately need to educate every citizen to his or her highest level of intellectual ability. To fail in that endeavor renders the final equation of a country like Haiti.